One of Waves’ closest, long-term friends is producer / engineer / programmer / bass player, and 8-time Grammy®-nominee, Tal Herzberg. The much sought after musician and sound engineer has countless studio credits and shaped sound recordings and CDs that collectively have sold over 50 million copies. At the age of 5, I started as a classical guitarist and studied classical until age 14. The true story behind me switching to the bass is rather comic and tragic. I had a roller skating accident and I broke both my hands at the same time. By the time the casts were removed and I did my physical therapy, it was pretty clear to me that I would have to go back 2 or 3 years worth of guitar practice just to regain my strength. I figured the closest instrument I could use my fingers and not utilize a pick would be the bass. That’s how I became a bass player at age 14. At 17, I was a professional working bass player in Israel. Based in Tel Aviv, I played with the top artists in the country, and also we have a military service back home, which most of it I did as a musician in a military band as a player. After I left the service at age 21 I immediately accumulated 60 album credits as a bass player for big name Israeli artists, doing live work, as a session guy, and as a road guy, I did a lot of jazz work in my free time. There are many people who play bass and there are very few bassists. And I was always attracted to the bassist aspect of playing bass, which is a way of life and a way of thinking. The bass is essentially the only instrument that holds equal responsibility on rhythm, melody and harmony. Jack Bruce, Jaco Pastorius, Paul McCartney, John Paul Jones, Larry Graham, and Charles Mingus are my influences. In the studio, I plug in one of the 35 bass guitars I own (most of the time a 5-string Stingray Music Man) through a Neve pre-amp, and Imperical Lab Distressor. I record directly into Pro Tools. I also like to run the signal into an amp, an Ampeg B-15 Vintage, and I mic it up with two microphones, an original tube Neumann U-47 and maybe an RE 20 Electro Voice. That’s my chain. Talk to me about the music scene in Israel that you played on recording sessions and gigs in the 80‘s and early 90‘s? The music scene is pretty much what it is in the U.K. and the States, a normal music industry, but the one different aspect is the size of the country and the amount of the people dictates a smaller marketplace all around, less records sold, and mostly small live venues. I think a Gold record today is still 20,000. Like Holland, Belgium, and Denmark, a smaller market. And also there is a language barrier, a good portion is sung in Hebrew. So, it’s hard to have international exposure to stuff that is not, for the most part, sung in English or French. You might have heard of Ofra Haza. I recorded with her and she had international success doing world music sung in Yemenite. She passed away very tragically seven years ago at a very young age. So when did you move to the States? You were an original ambassador for Waves introducing the product line in America almost 15 years ago. It’s still very much a part of your recording world. How did Waves enter your life? I went to my first A.E.S. (Audio Engineering Society) convention in San Francisco. I took the flight from Burbank to San Francisco, and I saw the launch of plugin architecture. God bless America. In 5 minutes, I could feel the industry was going to take a massive technogical change of direction. I’m hanging around, and see a sign that says Development Partners, and by then I could read plugin architecture and real time processing. I go to the Waves booth, see three guys, and I recognize one of them. Alon, he was the GM of the company, and I was two years in the States. I remembered him from Israel where he was a studio manager in Tel Aviv. He was working for Waves and he mentioned that they make plugins for Pro Tools. He explained the equipment. He showed me some things and called over either Gilad Keren or Meir who started the company. I saw the equalizer and compressor. I saw the future right at that moment. An announcement. Because I could now see professional disc-based recording and editing, 16 tracks real-time. So, Gilad and I went to nosh, and on the spot, he says “You want to work for us?” “Do what?” “Just say yes or no and we will worry about the rest.” How impulsive and classic. “OK. Yes. I guess.” A week later 2 guys from Waves Knoxville office came to my apartment in Hollywood, stayed in a $60-a-night hotel on Franklin Avenue. The company was just starting up, and they brought me a whole Pro Tools setup, software, and in 3 days gave me a crash course in high-level Pro Tools operating, plugins, and content. Did you come from an analog tape world? So, they allow me to go there, with a system, a little truck, set up and present the technology that Waves could make available to them. I was available for questions and trouble shooting, and they would try and process the stuff through the plugins. I was there to physically smell the chemical reaction of people’s bodies to what these tools were about. I wasn’t coming in there as some know-it-all audio engineering guy, but more as a musician, really. Musicians get a different category of respect. And I slowly started noticing the edge that I gained by being perceived as both a sharp musician and a sharp new technology kind of guy. Waves was doing some interesting pioneering work. After about 3 years, I went back on the road with Beth Hart. We've made two albums on Atlantic, the first one produced by Mike Clink and Hugh Padgham, and the second one produced by Oliver Leiber and myself. We opened for Soundgarden and Metallica on the 1996 Lollapalooza Tour. We also toured with the Scorpions in Canada and Europe. I started working with Rob Cavallo and Allen Sides at studios such as Ocean Way, Record One. A&M. And through Allen, I got to learn my engineering chops on a higher level. Waves is still involved in my recording arsenal, more so now than ever. I’ve always been kept in the loop with Waves, testing equipment and pre-releases of software. Most people became familiar with Waves around the L1. It is a digital limiter, which can be used for any audio application one can imagine, from mastering, recording, mixing, broadcasting, web casting, you name it. Limiters have been used in radio probably since Marconi. Today, maybe I’ll use the L2 or L3, but that whole family of limiters started with the L1. And consequently, it became a whole family of L’s. Even today, Waves is my Swiss Army knife. It’s always with me wherever I go in the world on an iLok. If I work in England, or New York, or in L.A, I will have it with me, then download the software if it’s not already on the DAW computer. I would not even have to ask for it in any studio that considers itself a professional establishment. In the old days, it was up to guys like me to initially evangelize the product to a point where enough people would have heard about it and would have purchased it. Waves is prominent in your current sound engineering work. It could be as simple as tracking a vocal with Mya, for instance. And she says, “I would like to have some reverb on my vocal when I’m tracking.” So, instinctively, I might set up an auxiliary track in Pro Tools, put the Waves Renaissance Reverb on the auxiliary from the vocal input from Pro Tools, and I got instant reverb, and even remember the settings from the session, and it’s an instinct go-to tool for me. Today the conversations about Waves is like having a conversation back in the day about a Studer tape machine or a Neve console. 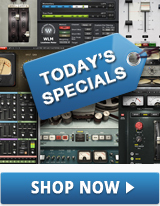 Nowadays, the dialogue is about Pro Tools and plugins for the most part, and speakers. Were plugins ever viewed, especially in the early days, as step-children in the studio? There were arguments between the diehard analog guys and diehard digital guys. I am trying to remain a believer in both. There are certain things that can be completely substituted by plugins, because they were digital to begin with, like digital reverb, for example. But anything that has to do with more classic analog gear such as EQ’s and compressors, and so forth, one can argue the differences between analog and its digital equivalent. Yet, if one chooses, it can be looked at as apples and oranges. And I reckon that they both perform the same functions, but they just do it differently and the result is obviously different. I wouldn’t consider it better or worse. I would consider it different. Ultimately, the challenge was to not convince people that we were killing what they were used to before, but introducing a new creature into this evolutionary system. Tell me about seeing music on screens, the use of screens to see sound patterns during engineering and production. My good friend, engineer and producer Ed Cherney answered this exact question. He said “Are you an enginEYE or enginEAR?” It’s a great quote. This sums it all up for me. However, I will tell you, after many experiences in this life, dealing with your DVD menu, TV menu, or computer, the mentality of a graphically-controlled environment is no longer strange. I find graphically represented processes very helpful. Waves has a tool, the PAZ Psychoacoustic Analyzer. It’s a spectrum analyzer that shows frequencies and stereo spread, which actually has a pretty accurate reading. It zooms in fairly deep to hone in on frequencies. You are very close to it. There are times when I would go to a studio I’m not so familiar with, and I’ll be mixing or recording, and “Oh my God! Am I really hearing what I think I’m hearing?” Because, the room might not be tuned great, or I’m just not familiar with it. I’ll instinctively throw in the PAZ if I’m doing a vocal, guitar or drums. I’ll insert the PAZ on every channel to check or examine, and I can see at least visually that I’m OK, or maybe I can see visually that I’m not OK. Maybe the room is really boomy, maybe I have too much bass and I’m not rolling enough of it off. The PAZ might tell me “You’re 6 db shy at 10k cycles and you better correct that.” So Waves PAZ is a go-to tool. When something is a go-to, you reach to your belt and pull out that tool. You were on a Green Day album. I did Pro Tools work on their "Warning" album. Billie Joe (Armstrong) is a really smart guy. Producer Rob Cavallo is a great producer and I had so much fun with him almost on a daily basis for about two years. His sessions are so much fun you don’t want to go home. We did a lot of rock stuff. Rob brings a lot to the table, as far as tempos, grooves, keys of the songs, sounds. Very hands-on. You do a lot of work with producer Ron Fair and have worked with him on hit records for close to a decade. Ron Fair’s best trait in the recording studio is that he keeps circling the wagon until he gets what he wants. He is relentless in that pursuit. You hear it and the proof is in the pudding. One of the first things Ron Fair ever told me, when I started working with him in the studio, was that we are not necessarily making music in the pure sense of the form, we’re making musical records. That is something that took me five years to digest. It’s a pretty heavy statement, doing the type of music that we specifically work on, reflecting his taste for show tunes, Broadway, jazz, ‘60s, R&B, pop, hip hop, mainstream pop. He knows his way around the studio and he knows how to make records. I’m working with Ron on the Pussycat Dolls, and we’re also with Nicole the lead singer on her solo album. You also have done lots of recording sessions with Black Eyed Peas and Fergie. There has never been anything like will.i.am from The Black Eyed Peas, his spirit as a musician and human being. Let’s start by saying he is an extremely intelligent person. Add to that great sense of musicality, beat, rhythm, fashion, style. This guy is a powerhouse and I’m in the company of greatness. He never obsesses over recording procedures. I worked on Fergie’s solo album as well. She is unbelievable and just a tremendously talented vocalist. Great tone, color of her voice is wonderful. Her pocket and rhythm is insane. She is so groovy and laid back when she wants to be. Excellent control. What is your most essential Waves processor? I like SoundShifter. It’s the world’s best pitch shifter and time-stretching plug. I’ve used it on everything I’ve done since it came out. Mixing occupies a quarter of my time. The rest is devoted to producing, programming, engineering, and even A&R. Often, my work as an editor happens in the multi-track stage and I have to perfect the performances. I like to make everything nice and tight. Some mixers tend to compress their mixing a lot, which doesn’t leave much room for extra gain on behalf of the mastering engineer. With Mya, I’ve recorded her vocal chain using a hardware L2 box as a converter and limiter, because I thought it would be great. She is very professional. Christina Aguilera is the consummate professional. The best out there. You don’t get better than her. As someone who’s used these tools throughout their career, what is it that makes Waves special? Waves products are unique because of their uniqueness…not because nobody else has an equalizer or a limiter or a reverb. Waves brings to the table a package. To me, any Waves plugin popping up on the screen is gonna have a familiar and logical look and parameters interface. And, also the sonic results are predictable. I can sort of imagine in my head what they are gonna sound like, which is a general thread all their plugins share. They have their own sound. I think that generally speaking, Waves set the benchmark for excellence in audio DSP programming. And they keep topping themselves. Do you have a philosophy or concept about engineering? I do what it takes to move the session forward. Sometimes it can be as little as lifting two faders, sticking a microphone out there, banging out a vocal, and going home. That would be one end of it. If there’s a lack of manpower around for certain tasks, I raise my hand, program something, or lay a guitar down so a singer can move forward. Do you use Waves GTR on your guitar tracks? Yes. It’s a great virtual guitar and amp effects simulator. Funny enough, I’m using it a lot in mixing. Because it’s designed for guitars, the specific processors that they included in the effects and amplifier section are great-sounding and gritty, which is very complimentary for guitars. There is a lot of gain. I’m almost always using their amp model as a re-amp for guitar signals that are recorded direct, and I can shape a sound that is very believable. In conjunction with their compression and EQ, distortion, vibrato and flanging, I just plug a guitar in and it sounds great. I crank the gain channel and I’m in heaven. Do you still play bass on sessions? Absolutely. Sometimes I plug my bass directly into Pro Tools using a pre-amp, no processing, and then I will compress, limit, and EQ using channel inserts in Pro Tools. This allows me to not commit to external processing gear, keeping the option to change the sound later on. So, instead of recording through my regular analog chain, sometimes I can just set up a digital chain with Waves plugins. I’m mixing in the box a lot. If a client calls and says “Can you raise the drums 2dB?” I’m booting the session, making the fix, because the automation is right there, and I will re-submit a new revision in a matter of 10 minutes. So, I can be in the midst of something, take a ten minute break, then resume. Business keeps going. Back in the day, you would have to manually recall an entire analog board and dozens of outboard processors. Today, Waves saves me time and energy.